Home / Savings Blog Posts / Recipes / Crock Pot Recipes / Crockpot Mexican Rice Recipe! Check out this Crockpot Mexican Rice Recipe for an easy side dish or dinner recipe! If you love to have rice with your meals, this Crockpot Mexican Rice Recipe is super easy to make an a great dish to make in the slow cooker! Make this as a side dish or as a dinner recipe for an easy way to add some flavor and color to your meal! My family loves to have Mexican Rice with enchiladas and tacos! Mmm, your family is sure to love this recipe! Plus, be sure to check out even more Dinner Recipes! Spray the bowl of a slow cooker liberally with nonstick spray. Add all ingredients beans through boiling water (reserve cilantro and cheese). Cover with lid; cook on low for 3 hours. Using a spatula, stir the rice mixture, then add half of the cheese and half the cilantro; stir to combine. Sprinkle the remaining cheese and cilantro on the top of the mixture; cover and cook for 10 more minutes. Store leftovers in airtight container for up to a week. If you don’t have a Crock Pot, be sure to check out the Crock Pots at Amazon! Now is a great time to grab one (or a second one) so that you can make even more Easy Crock Pot Recipes! Receive Free Shipping with Amazon Prime, or Free Super Saver Shipping on orders of $35 or more! 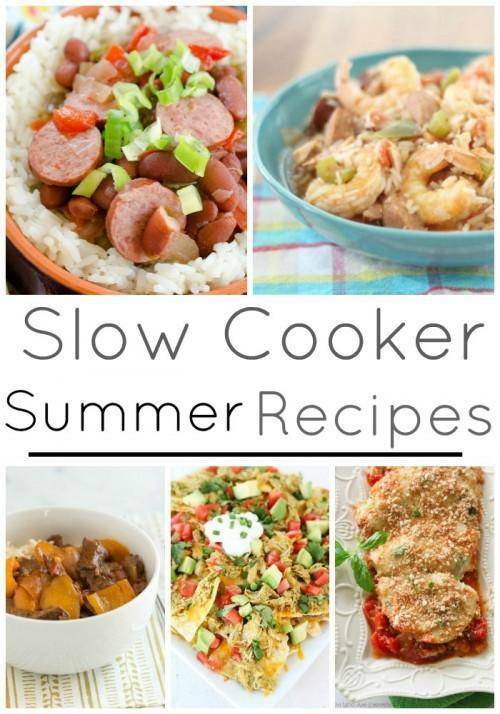 Plus, be sure to check out these 15 Slow Cooker Summer Meals for options to help you with your meal plan this week! Is the rice pre-cooked or will it cook in the crockpot? Also, instruction 2 doesn’t make sense? Looks delicious and hoping to make it this week! Thanks!